He was the sole surviving son of Sir John More, barrister and later judge, by his first wife Agnes, daughter of Thomas Graunger. While still a child Thomas was sent to St. Anthony’s School in Threadneedle Street, kept by Nicholas Holt, and when thirteen years old was placed in the household of Cardinal Morton, Archbishop of Canterbury, and Lord Chancellor. Here his merry character and brilliant intellect attracted the notice of the archbishop, who sent him to Oxford, where he entered at Canterbury Hall (subsequently absorbed by Christ Church) about 1492. His father made him an allowance barely sufficient to supply the necessaries of life and, in consequence, he had no opportunity to indulge in “vain or hurtful amusements” to the detriment of his studies. At Oxford he made friends with William Grocyn and Thomas Linacre , the latter becoming his first instructor in Greek. Without ever becoming an exact scholar he mastered Greek “by an instinct of genius” as witnessed by Pace (De fructu qui ex doctrina percipitur, 1517), who adds “his eloquence is incomparable and twofold, for he speaks with the same facility in Latin as in his own language”. Besides the classics he studied French, history, and mathematics, and also learned to play the flute and the viol. After two years’ residence at Oxford, More was recalled to London and entered as a law student at New Inn about 1494. In February, 1496, he was admitted to Lincoln’s Inn as a student, and in due course was called to the outer bar and subsequently made a bencher. His great abilities now began to attract attention and the governors of Lincoln’s Inn appointed him “reader” or lecturer on law at Furnival’s Inn, his lectures being esteemed so highly that the appointment was renewed for three successive years. It is clear however that law did not absorb all More’s energies, for much of his time was given to letters. He wrote poetry, both Latin and English, a considerable amount of which has been preserved and is of good quality, though not particularly striking, and he was especially devoted to the works of Pico della Mirandola, of whose life he published an English translation some years later. He cultivated the acquaintance of scholars and learned men and, through his former tutors, Grocyn and Linacre, who were now living in London, he made friends with Colet, Dean of St. Paul’s, and William Lilly, both renowned scholars. Colet became More’s confessor and Lilly vied with him in translating epigrams from the Greek Anthology into Latin, then joint productions being published in 1518 (Progymnasnata T. More et Gul. Liliisodalium). 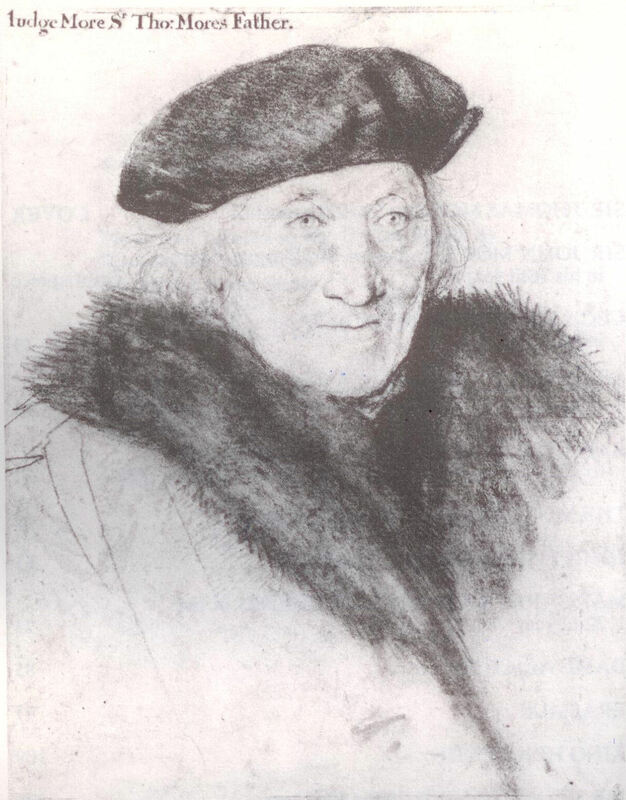 In 1497 More was introduced to Erasmus, probably at the house of Lord Mountjoy, the great scholar’s pupil and patron. The friendship at once became intimate, and later on Erasmus paid several long visits at More’s Chelsea house, and the two friends corresponded regularly until death separated them. Besides law and the Classics, More read the Fathers with care, and he delivered, in the Church of St. Lawrence Jewry, a series of lectures on St. Augustine’s De civitate Dei, which were attended by many learned men, among whom Grocyn, the rector of the church, is expressly mentioned. For such an audience the lectures must have been prepared with great care, but unhappily not a fragment of them has survived. These lectures were given somewhere between 1499 and 1503, a period during which More’s mind was occupied almost wholly with religion and the question of his own vocation for the priesthood. 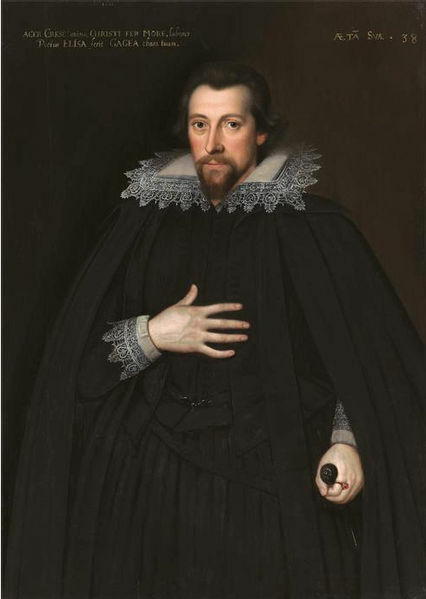 Portrait of Christopher Cresacre More (1572‒1649), great-grandson and biographer of St Thomas More. It is absurd to assert that More was disgusted with monastic corruption, that he ‘loathed monks as a disgrace to the Church’. He was throughout his life a warm friend of the religious orders, and a devoted admirer of the monastic ideal. He condemned the vices of individuals; he said, as his great-grandson says, ‘that at that time religious men in England had somewhat degenerated from their ancient strictness and fervor of spirit’; but there is not the slightest sign that his decision to decline the monastic life was due in the smallest degree to a distrust of the system or a distaste for the theology of the Church. 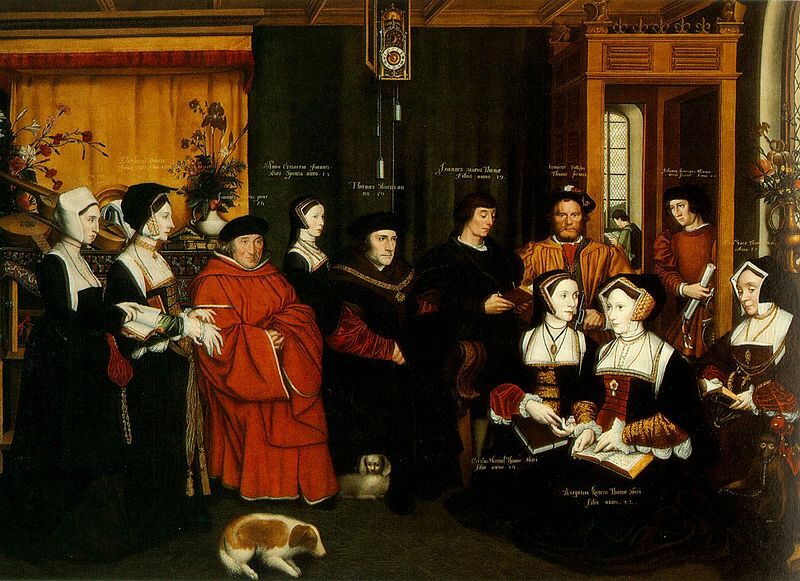 St. Thomas More and his family, painting by Rowland Lockey. The question of religious vocation being disposed of, More threw himself into his work at the Bar and scored immediate success. In 1501 he was elected a member of Parliament, but as the returns are missing his constituency is unknown. Here he immediately began to oppose the large and unjust exactions of money which King Henry VII was making from his subjects through the agency of Empson and Dudley, the latter being Speaker of the House of Commons. In this Parliament Henry demanded a grant of three-fifteenths, about 113,000 pounds, but thanks to More’s protests the Commons reduced the sum to 30,000. Some years later Dudley told More that his boldness would have cost him his head but for the fact that he had not attacked the king in person. Even as it was Henry was so enraged with More that he “devised a causeless quarrel against his father, keeping him in the Tower till he had made him pay a hundred pounds fine” (Roper). Meanwhile More had made friends with one “Maister John Colte, a gentleman” of Newhall, Essex, whose oldest daughter, Jane, he married in 1505. Roper writes of his choice: “albeit his mind most served him to the second daughter, for that he thought her the fairest and best favored, yet when he considered that it would be great grief and some shame also to the eldest to see her younger sister preferred before her in marriage, he then, of a certain pity, framed his fancy towards” the eldest of the three sisters. 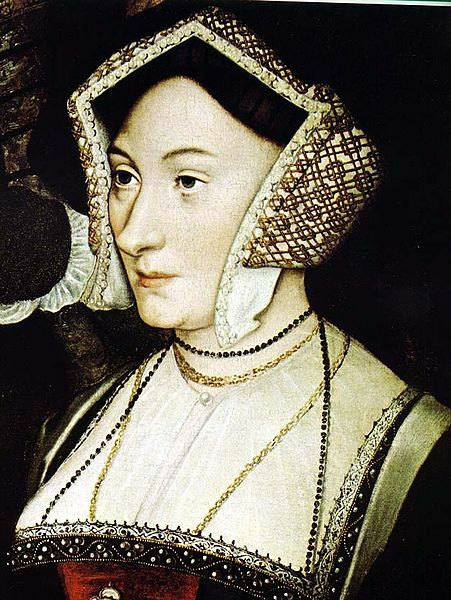 The union proved a supremely happy one; of it were born three daughters, Margaret, Elizabeth, and Cecilia, and a son, John; and then, in 1511, Jane More died, still almost a child. In the epitaph which More himself composed twenty years later he calls her “uxorcula Mori”, and a few lines in one of Erasmus’ letters are almost all we know of her gentle, winning personality. To begin then with what is least known to you, in stature he is not tall, though not remarkably short. His limbs are formed with such perfect symmetry as to leave nothing to be desired. His complexion is white, his face rather than pale and though by no means ruddy, a faint flush of pink appears beneath the whiteness of his skin. His hair is dark brown or brownish black. The eyes are grayish blue, with some spots, a kind which betokens singular talent, and among the English is considered attractive, whereas Germans generally prefer black. It is said that none are so free of vice. His countenance is in harmony with his character, being always expressive of an amiable joyousness, and even an incipient laughter and, to speak candidly, it is better framed for gladness than for gravity or dignity, though without any approach to folly or buffoonery. The right shoulder is a little higher than the left, especially when he walks. This is not a defect of birth, but the result of habit such as we often contract. In the rest of his person there is nothing to offend . . .He seems born and framed for friendship, and is a most faithful and enduring friend . . .When he finds any sincere and according to his heart, he so delights in their society and conversation as to place in it the principal charm of life . . .In a word, if you want a perfect model of friendship, you will find it in no one better than in More . . .In human affairs there is nothing from which he does not extract enjoyment, even from things that are most serious. If he converses with the learned and judicious, he delights in their talent, if with the ignorant and foolish, he enjoys their stupidity. He is not even offended by professional jesters. With a wonderful dexterity ha accommodates himself to every disposition. As a rule, in talking with women, even with his own wife, he is full of jokes and banter. No one is less led by the opinions of the crowd, yet no one departs less from common sense . . . (see Father Bridgett’s Life, p. 56-60, for the entire letter). 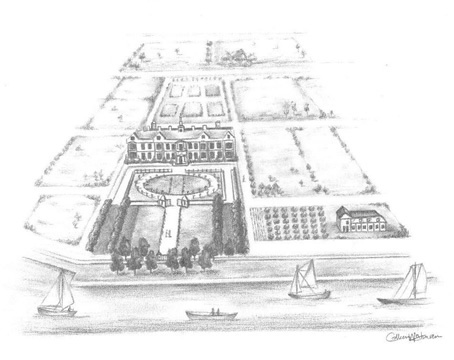 Sir Thomas More’s Estate at Chelsea, sketch by Colleen Westman, based on a 1695 engraving of the property. More’s fame as a lawyer was now very great. In 1510 he was made Under-Sheriff of London, and four years later was chosen by Cardinal Wolsey as one of an embassy to Flanders to protect the interests of English merchants. 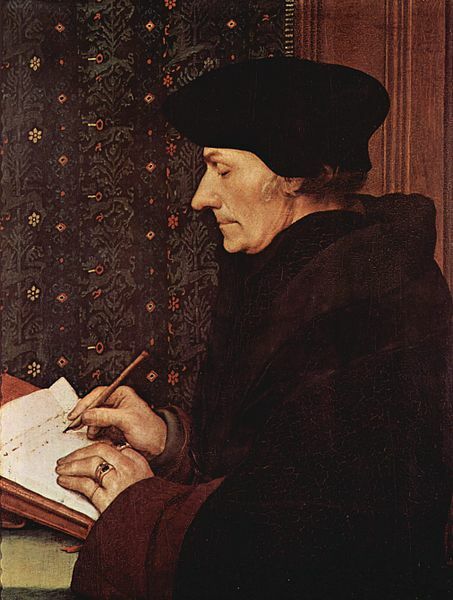 He was thus absent from England for more than six months in 1515, during which period he made the first sketch of the , his most famous work, which was published the following year. Both Wolsey and the king were anxious to secure More’s services at Court. In 1516 he was granted a pension of 100 pounds for life, was made a member of the embassy to Calais in the next year, and became a privy councilor about the same time. In 1519 he resigned his post as Under-Sheriff and became completely attached to the Court. In June, 1520, he was in Henry’s suite at the “Field of the Cloth of Gold”, in 1521 was knighted and made sub-treasurer to the king. When the Emperor Charles V visited London in the following year, More was chosen to deliver the Latin address of welcome; and grants of land in Oxford and Kent, made then and three years later, gave further proof of Henry’s favor. In 1523 he was elected Speaker of the House of Commons on Wolsey’s recommendation; became High Steward of Cambridge University in 1525; and in the same year was made Chancellor of the Duchy of Lancaster, to be held in addition to his other offices. In 1523 More had purchased a piece of land in Chelsea, where he built himself a mansion about a hundred yards from the north bank of the Thames, with a large garden stretching along the river. Here at times the king would come as an unbidden guest at dinner time, or would walk in the garden with his arm round More’s neck enjoying his brilliant conversation. 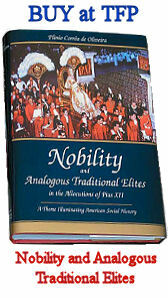 But More had no illusions about the royal favor he enjoyed. 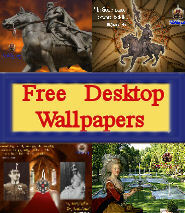 “If my head should win him a castle in France,” he said to Roper, his son-in-law, in 1525, “it should not fail to go”. The Lutheran controversy had now spread throughout Europe and, with some reluctance, More was drawn into it. His controversial writings are mentioned below in the list of his works, and it is sufficient here to say that, while far more refined than most polemical writers of the period, there is still a certain amount that tastes unpleasant to the modern reader. At first he wrote in Latin but, when the books of Tindal and other English Reformers began to be read by people of all classes, he adopted English as more fitted to his purpose and, by doing so, gave no little aid to the development of English prose. 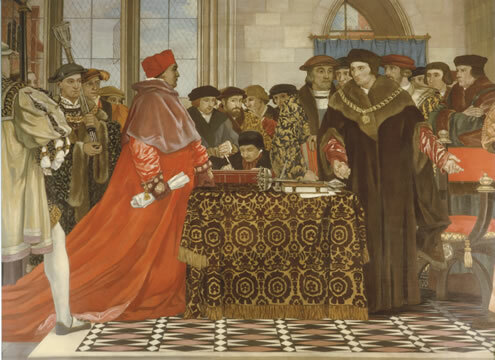 St. Thomas More Defending the Liberty of the House of Commons, painting by Vivian Forbes, 1927, St. Stephen’s Hall, English Parliament, London. When More some time had Chancellor been No more suits did remain. The like will never more be seen, Till More be there again. As chancellor it was his duty to enforce the laws against heretics and, by doing so, he provoked the attacks of Protestant writers both in his own time and since. The subject need not be discussed here, but More’s attitude is patent. He agreed with the principle of the anti-heresy laws and had no hesitation in enforcing them. As he himself wrote in his “Apologia” (cap. 49) it was the vices of heretics that he hated, not their persons; and he never proceeded to extremities until he had made every effort to get those brought before him to recant. How successful he was in this is clear from the fact that only four persons suffered the supreme penalty for heresy during his whole term of office. More’s first public appearance as chancellor was at the opening of the new Parliament in November, 1529. The accounts of his speech on this occasion vary considerably, but it is quite certain that he had no knowledge of the long series of encroachments on the Church which this very Parliament was to accomplish. A few months later came the royal proclamation ordering the clergy to acknowledge Henry as “Supreme Head” of the Church “as far as the law of God will permit”, and we have Chapuy’s testimony that More at once proffered his resignation of the chancellorship, which however was not accepted. His firm opposition to Henry’s designs in regard to the divorce, the papal supremacy, and the laws against heretics, speedily lost him the royal favor, and in May, 1532, he resigned his post of Lord Chancellor after holding it less than three years. This meant the loss of all his income except about 100 pounds a year, the rent of some property he had purchased; and, with cheerful indifference, he at once reduced his style of living to match his strained means. The epitaph he wrote at this time for the tomb in Chelsea church states that he intended to devote his last years to preparing himself for the life to come. For the next eighteen months More lived in seclusion and gave much time to controversial writing. Anxious to avoid a public rupture with Henry he stayed away from Anne Boleyn’s coronation, and when, in 1533, his nephew William Rastell wrote a pamphlet supporting the pope, which was attributed to More, he wrote a letter to Cromwell disclaiming any share therein and declaring that he knew his duty to his prince too well to criticize his policy. 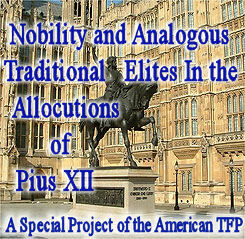 Neutrality, however, did not suit Henry, and More’s name was included in the Bill of Attainder introduced into the Lords against the Holy Maid of Kent and her friends. Brought before four members of the Council, More was asked why he did not approve Henry’s anti-papal action. He answered that he had several times explained his position to the king in person and without incurring his displeasure. Eventually, in view of his extraordinary popularity, Henry thought it expedient to remove his name from the Bill of Attainder. The incident showed that he might expect, however, and the Duke of Norfolk personally warned him of his grave danger, adding “indignatio principis mors est”. 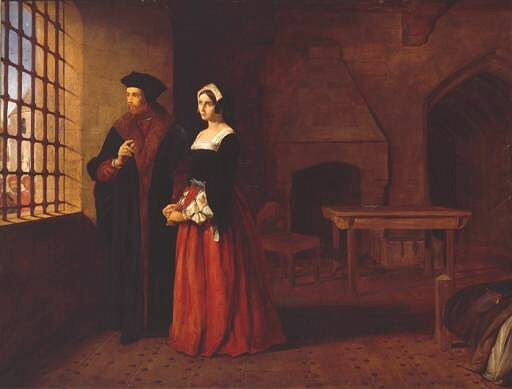 “Is that all, my Lord,” answered More, “then, in good faith, between your grace and me is but this, that I shall die today, and you tomorrow.” In March, 1534, the Act of Succession was passed which required all who should be called upon to take an oath acknowledging the issue of Henry and Anne as legitimate heirs to the throne, and to this was added a clause repudiating “any foreign authority, prince or potentate”. On 14 April, More was summoned to Lambeth to take the oath and, on his refusal, was committed to the custody of the Abbot of Westminster. Four days later he was removed to the Tower, and in the following November was attainted of misprision of treason, the grants of land made to him in 1523 and 1525 being resumed by the Crown. In prison, though suffering greatly from “his old disease of the chest . . .gravel, stone, and the cramp”, his habitual gaiety remained and he joked with his family and friends whenever they were permitted to see him as merrily as in the old days at Chelsea. When alone his time was given up to prayer and penitential exercises; and he wrote a “Dialogue of Comfort Against Tribulation”, treatise (unfinished) on the Passion of Christ, and many letters to his family and others. 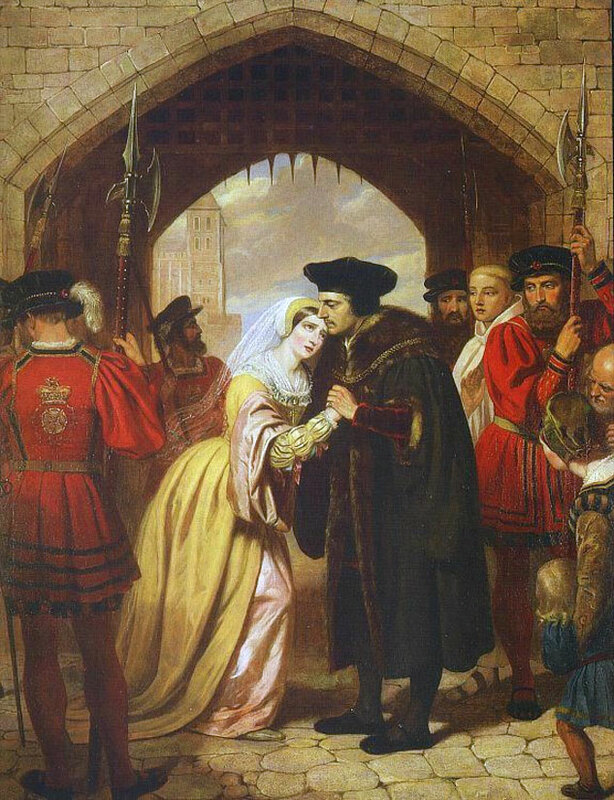 In April and May, 1535, Cromwell visited him in person to demand his opinion of the new statutes conferring on Henry the title of Supreme Head of the Church. More refused to give any answer beyond declaring himself a faithful subject of the king. In June, Rich, the solicitor-general, held a conversation with More and, in reporting it, declared that More had denied Parliament’s power to confer ecclesiastical supremacy on Henry. It was now discovered that More and Fisher, the Bishop of Rochester, had exchanged letters in prison, and a fresh inquiry was held which resulted in his being deprived of all books and writing materials, but he contrived to write to his wife and favorite daughter, Margaret, on stray scraps of paper with a charred stick or piece of coal. On 1 July, More was indicted for high treason at Westminster Hall before a special commission of twenty. More denied the chief charges of the indictment, which was enormously long, and denounced Rich, the solicitor-general and chief witness against him as a perjuror. The jury found him guilty and he was sentenced to be hanged at Tyburn, but some days later this was changed by Henry to beheading on Tower Hill. The story of his last days on earth, as given by Roper and Cresacre More, is of the tenderest beauty and should be read in full; certainly no martyr ever surpassed him in fortitude. As Addison wrote in the Spectator (No. 349) “that innocent mirth which had been so conspicuous in his life, did not forsake him to the last . . .his death was of a piece with his life. There was nothing in it new, forced or affected. He did not look upon the severing of his head from his body as a circumstance that ought to produce any change in the disposition of his mind”. The execution took place on Tower Hill “before nine of the clock” on 6 July, the body being buried in the Church of St. Peter ad vincula. 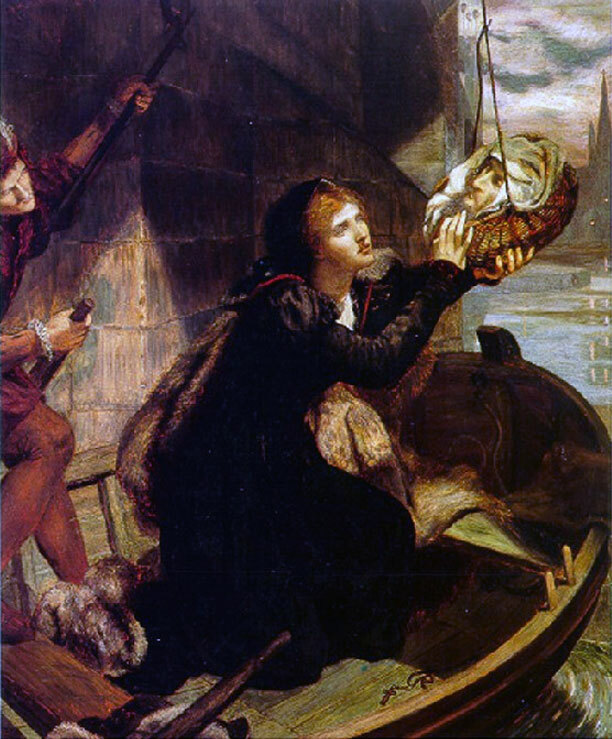 Margaret Roper Rescuing the Head of Her Father. 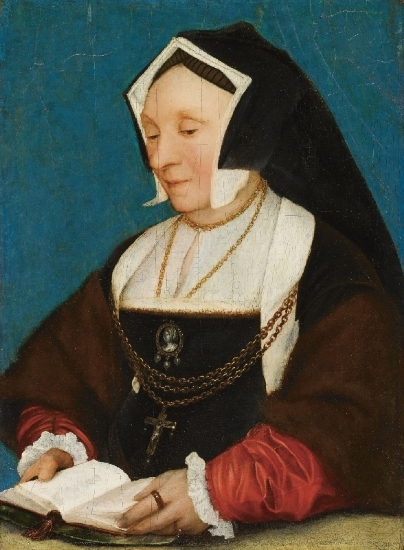 Margaret Roper, the eldest daughter of Sir Thomas More. 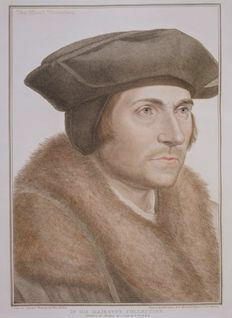 Painted by Holbein. 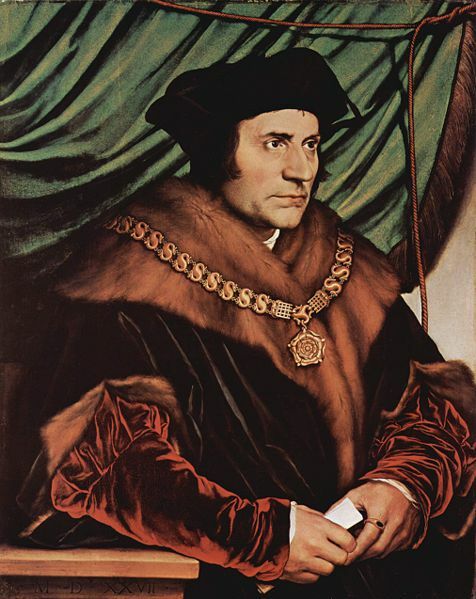 Henry VIII and St. Thomas More represented two profoundly different Englands and at the core of their divergence were discrepant views of the principle of authority. Henry VIII represented the burgeoning revolutionary England. In the language of today’s political landscape, one could say that Henry VIII’s view of authority would be libertarian. He was the sole point of reference. He accepted no restraint to his whims and wishes, be it from God, the Church, Parliament, common law, nobleman, churchman, or commoner. His was the only authority he was prepared to accept. And he was in a position to abuse the royal power to eliminate anyone who challenged him. 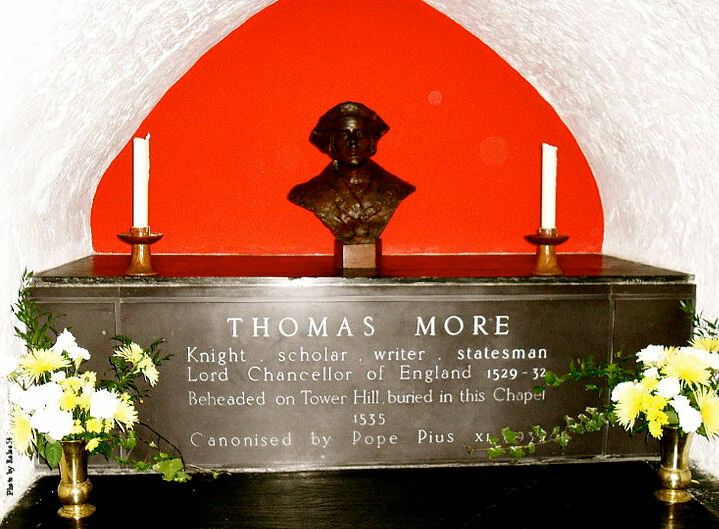 St. Thomas More represented the Christian England of old. For him, God and the natural moral law were the supreme point of reference. From this medieval perspective, the various overlapping levels of authority that governed temporal affairs were themselves subject to God and the unchanging higher law which applies to everyone, everywhere, and at all times. 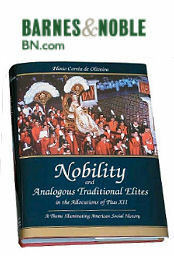 In this harmonious hierarchy of authorities, royal authority had its proper place, one deserving of every respect and obedience, but it could never supplant God, the Supreme Authority.